Glasgow Women’s Library is a unique resource in Scotland, and houses an amazing collection of materials by, for and about women. We have no budget for materials and our collections have grown over the past 25 years through the sheer generosity of our users, members and supporters. This makes the Library and its collection unique, special and diverse. We will be delighted to consider donations of books that focus on women’s lives, histories and achievements. However, there are always exceptions to any rule, so please check with library staff. It it a huge help if you can provide us with a list of the books you would like to donate, as this allows us to check if we already have them in stock. Please contact our librarian, Wendy Kirk if you are considering donating books to the Library. Due to space and resource limitations, we may not be able to accept all donations. In some cases we may be able to suggest other organisations where donations might be welcome. We cannot guarantee that all donations will be included or remain permanently in the library collection. We will dispose of any materials that we cannot use by offering them to other organisations, selling them in book sales or recycling them. Some women have donated their entire collection of books to the library in their will, or donated a special collection on a specific subject area. We are delighted to accept such large donations and keen to recognise their important contribution to the library. Donations will normally be integrated into the main library collection. However, exceptions may be made in the case of special or valuable collections. We are happy to acknowledge large donations in our library catalogue, if desired. Glasgow Women’s Library seeks to document different women’s histories and lives, whether in oral, visual or written form. Donations are assessed as to their fit with our policy and aims on a case-by-case basis and it is always best to speak to our Archivist to seek advice before offering any material. Below are some general guidelines to the kinds of archive materials and objects that we collect. Our Collections Development Policy gives more detailed information about the types of material we accept and the procedures that we follow. In general, we aim to collect objects and archives that build upon the strengths of our existing collections and only if their condition and medium can be supported by our resources. If we cannot accommodate material, we will do our best to recommend another home at a sister library, archive or museum. We ask everyone who donates to our collection to complete an Archive Deposit Agreement or Museum Object Entry form (if you are not sure which you should complete, please contact us). Please bear in mind that we cannot accept any unsolicited personal or unpublished material without an agreement in place, if in doubt please contact us. Archives and museum objects take many different forms. Our current collections include music on tape and vinyl; recorded oral histories and video documentaries; artworks including prints, paintings and ceramics; documents such as minutes, conference proceedings, administrative papers, newsletters, correspondence, fanzines, posters and flyers; we also have campaign objects such as badges, banners and t-shirts. For audio-visual and digital resources we seek to collect in standard formats which we can support and preserve long term. In some cases and where it is appropriate we will refer material to another library, archive or museum. We are particularly keen to build on our collection of women’s liberation or second-wave feminist materials from the 1970s and 80s, especially ‘at risk’ or rare items such as unpublished or fragile materials or ephemera created by individuals, or grassroots women’s organisations, collectives and societies, especially those based in Scotland. We would be happy to receive donations of material that documents everyday women’s lives before 1970, such as magazines, advertising materials, cookbooks and knitting and dressmaking patterns. The library is home to the Lesbian Archive Collection, a UK-wide national resource that was originally set up in 1984 in London. The task of recovering and archiving lesbian history in the UK is a pressing one and the Lesbian Archive relies on donations from women around the UK to build up its collection, making it representative of lesbian and bisexual women’s lives throughout the British Isles. If you have anything that documents the history of lesbianism, and lesbian and bi-sexual lives and culture from across the UK we would be delighted to hear from you. In particular, the Lesbian Archive has a strong collection of oral histories gathered from lesbians. If you know anyone whose story you think we should be recording, or if you would like to add your story to the archive, please get in touch. Banners, placards, t-shirts, protest leaflets, badges, photographs (citations on reverse are always appreciated), personal memoirs, diaries, journals, films & documentaries, postcards, women-only retreat literature. We have a deficit of material from both Wales and Northern Ireland so if you have ephemera relating to these countries, we would enthusiastically welcome it. We are especially keen to collect material from smaller, local projects that you may have been involved with – local clubs (tickets, advertisements, flyers), local projects (youth groups, social groups), local activism (banners, newspaper clippings). We want our collection to be as comprehensive as possible and to reflect the wide variety of actions and activities that have happened throughout the UK. We have an extensive collection of periodicals and journals relating to feminism and the women’s movement including such titles as Spare Rib, Trouble & Strife, Harpies & Quines, and MsPrint. We would be delighted to receive fanzines, local newsletters and periodicals, particularly those related to Scottish women and to lesbian life. In most cases we do not have full runs of titles and we are often looking for specific issues to fill in the gaps. To find out what we currently need, please check our list of the journals we are looking for. If you have any other titles that you would like to donate please contact our Archivist, Nicola Maksymuik, or the Librarian, Wendy Kirk. In many cases, for the more popular items that we already have, we can’t offer to accept more issues as we have limited storage capacity. In this case there is the possibility that another archive or group might accept them. Although we do hold a newspaper cuttings archive, due to resource restrictions we can no longer take in current news paper cuttings and ‘grey’ material (i.e. photocopies of published material). We can only keep older newspaper cuttings if their historical and informational value outweighs the cost of long-term preservation. Because of space restrictions, mainstream women’s magazines after 1980 will only be collected if they relate particularly to feminism, women in Scotland and lesbian issues. 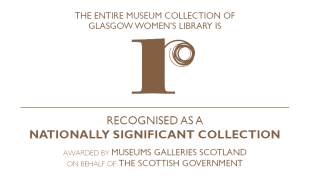 We are particularly keen to receive personal collections relating to individual lives, from black, minority and ethnic communities, as well as diaries, artworks, manuscripts, songs, notebooks, correspondence and ephemera from pioneering Scottish women and lesbian women prominent in various fields such as art, politics, sport, literature education, media, medicine, science and other areas of public life. As part of our deposit agreement and to meet the requirements of Data Protection law, we will not make any personal, confidential material available to researchers whilst the person involved is still alive without their permission. We can also close some archives to the public for a period of years after the death of the individual if this is desired. However, please bear in mind that private collections will not be accepted if the number of confidential items under restricted access outweighs the costs of long-term preservation. As stated above, these are only general guidelines and the best thing to do is to contact and speak to our Archivist or Librarian before deciding to offer us any material. Unfortunately we are unable to cover the cost of transporting books to the library. However in exceptional cases, where the donated books are deemed by senior library staff to be of considerable benefit to the library collection, a contribution towards transportation costs may be possible. Please contact us for more advice about this or any aspect of making a donation. We are very grateful for donations to the library – without them our collections would not exist. Thank you!